6 Teams. $40,000. 100 days. Mentoring Provided. San Jose. Rio de Janeiro. Omaha. Berlin. Des Moines. AND Number 6? Ames, Iowa. Home to Iowa State University. And where you’ll find the only Student Team participating in the Accelerator. This is no small feat. 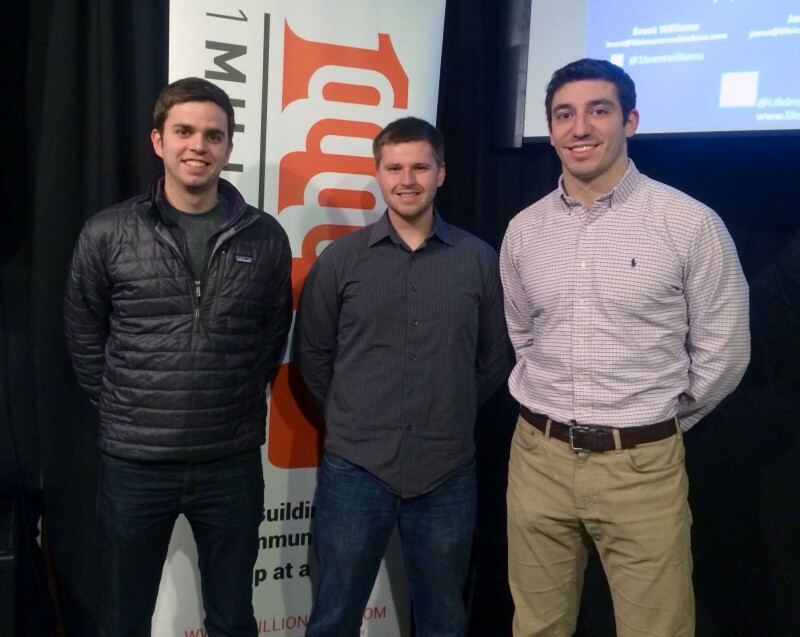 ISU Industrial Engineering & Entrepreneurial students, Tyler Fox, Justin Coadrake and Morgan Hampel are hitting the ground running with their exciting startup, ClinicNote. ClinicNote solves the problem that has plagued speech pathologists for years. ClinicNote allows them to record notes from their patient’s visits, by switching from traditional pen & paper to digital note taking for fast and instant insurance reports. Why is this important? An insurance company will approve a therapist for a limited number of sessions in a given time frame. After that time frame is up, the therapists must write the progress report to get approval for the next time frame of sessions. However, there is no standard format for reports. This causes the therapists to have to guess what the insurance companies want. Lots of unnecessary delays and lost time and money for the professionals. ClinicNote is creating the platform for a better speech pathology office insurance reporting system. 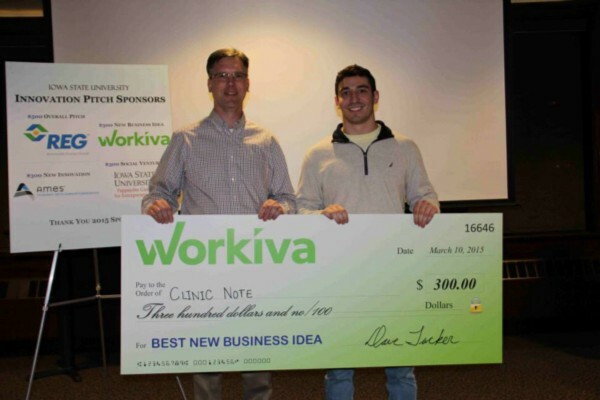 In a recent sit-down with Tyler Fox, we caught up on the background of ClinicNote, how they got selected into GIA, and how entrepreneurship at Iowa State has impacted the team. Wright: What is the background of ClinicNote and the problem you solve? Through this approach, we were able to find out which part of their day they didn’t like or what frustrated them the most. Their voice would change when they spoke of their problem area. So based around the problems we found for each industry, we brainstormed ideas about how to solve them. However, for these industries, we were never able to get traction with our ideas, or the ideas were too costly to pursue. Justin Coadrake (the third team member of ClinicNote) was already a good friend of ours. One day he mentioned to us how his girlfriend had complained about the speech pathology field and the process with insurance reports. We decided to give the speech industry a go on this same lean startup approach. We began calling speech therapists. It just took off. Wright: Why do you think the speech pathology field responded so well to your ideas? Fox: Finding an industry where people want to innovate or they really care about helping other people — this is huge. We were learning that the number one reason people go into speech pathology is to help someone. We’d be calling 50-year old Professional Speech Therapists running their businesses and they’d hear a young, college student on the line trying to solve one of their problems. Of course they wanted to help us help themselves! Wright: Tell us about getting accepted into the GIA. Fox: Justin Coadrake was a student in Kevin Kimle’s Ag Entrepreneurial class. He found out there were extra spots for an event being held at seed genetics entrepreneur & billionaire Harry Stine’s house. Usually the opportunity was for students in only the agriculture major, but Justin got the okay to go, and he invited Morgan and me. While we were at Stine’s house, Morgan recognized venture capitalist Scott Hoekman of Next Level Ventures. They had met prior at the Okoboji Entrepreneurship Institute (OEI). Both Morgan and Justin had attended OEI earlier that summer, a weeklong entrepreneurial program that the ISU Pappajohn Center for Entrepreneurship supports in partnership with the Iowa Lake’s Corridor organization. Because Morgan knew Scott from OEI, we felt comfortable approaching him and discussing our speech pathology business idea. Scott excitedly told us about GIA — how he read an article in the Des Moines Register about GIA still looking for applicants. Following the event, Scott introduced us to Tej Dhawan, the interim managing director of GIA. Tej met with all three of us to hear us out. He liked us enough to set us up with Brian Hemesath (ISU alumni, ’99 Computer Engineering), the soon-to-be managing director of GIA at the time. We met Brian at a coffee shop without knowing that he had already decided it would be a “hard no” to to our team’s request to go into the Accelerator. However, we get to talking with Brian and tell him about our 50+ discovery calls with speech therapists and he starts to listen. He starts to see the value in what we’re doing. The talking evolves and Brian soon has an idea of creating a Student Team spot for the Accelerator, where we could participate. Without a doubt, we all respond with a yes. The meeting ends and Brian goes back to his Board to convince them of this Student Spot. All of us are thinking, “so you’re saying there’s a chance?” We keep repeating this in the back of our minds as the weeks go on. We finally hear back from Brian about the student spot, “You guys are in!” All of a sudden we have the feeling that our worlds have completely changed. Everything just fell into place. But that’s not even all of it. A week before the accelerator starts, Brian calls us down to create a video to share with his Board. He tells us the reason that he’s doing it is for the Board to meet us. After creating the video, he tells us it’s really to ask the Board to consider us for a full spot in the Accelerator. Aka…the $40,000 seed grant! With only a week away from the Accelerator starting, we don’t hear from Brian. Then Sunday before it starts, at 9 o’clock at night, Justin gets the call from Brian. We are in! No longer a Student Spot. Full access to mentors and workspace. Oh, and a cool $40,000! Wright: Reflecting on your path to the Accelerator now, what is your takeaway from this experience? Fox: You hear the cliché — It’s all about who you know, and who you know… But THAT IS literally what it’s about. We wouldn’t be anywhere if it wasn’t for knowing people. And this doesn’t stop after joining the Accelerator. It’s a continuous theme as this is exactly what the Accelerator offers with its extensive network of mentors and doors that are constantly open. Wright: What is the biggest challenge in the Accelerator? Fox: The biggest challenge of it all — is that because we are young, everyone has their two-cents to offer to the “young-gun, college students.” It’s true that they ALL have extremely valuable information that we need to know. However, just because we need to know it, doesn’t mean we need to know it TODAY. Wright: What is the biggest challenge with ClinicNote? Fox: Getting in front of the right people — pre-service reviewers, claims insurance, and healthcare insurance companies. It was really easy to get in front of speech therapists. Now we need all the help with intros to the insurance side. Wright: How has entrepreneurship at ISU impacted you and your team? Fox: All three members of our team have been involved with the ISU Entrepreneurship programs and classes. Through both the Entrepreneurship Seminar Class and Ag Entrepreneurship class, we knew of the Pappajohn Center for Entrepreneurship. That’s where we met Judi Eyles. We actually met with Judi twice a month as a sounding board, and more importantly, keeping us accountable. It was having this accountability and support that had the biggest impact for us. We want people to know that the Pappajohn Center is THE outlet for encouraging entrepreneurship. Wright: What do you wish to see in the Ames entrepreneur community? Fox: We would like to see the entrepreneur community outside of campus grow. Ames is a college town, so it’s naturally focused on people getting jobs after they graduate, but not necessarily in nurturing the businesses in the larger Ames region. Wright: Sounds like an opportunity. And I think that’s a good way to come to an end. Thanks, Tyler for sharing your story! Learn more about ClinicNote at www.clinicnote.com.